Normally, this course would be a 15 week course on SQL databases. We will cover all the material from that 15 week course in 11 weeks. The pace of the class is fast. The last month of the course will be a mini-course on noSQL databases. For the SQL component, we will be going through the textbook, one chapter per week. You are responsible for keeping up with the reading. I will not lecture on material covered in the textbook. In the first 11 weeks there are 5 Readiness Assessment Tests (RATs) that assess whether you have read the material. The vast majority of the class time is spent doing not listening to me yabbering away. You will be working on tasks that require you to apply the knowledge you have gained from reading the textbook. Because of the hands-on nature of the course, you will need to bring a laptop if you are to gain full benefit from the course. There is a 6 week long programming project where teams will design and implement a web application that uses a MySQL database. There is a 3 week long programming project where teams design and implement a web app using a nonSQL database. PHP and MySQL Web Development. Luke Welling and Laura Thomsom. Any edition. $34.64 from Amazon. Head First PHP & MySQL. Lynn Beighley and Michael Morrison. $29.69 from Amazon. If you have a laptop I encourage you to bring it to class for several reasons. First, you can install a web server on it and do the in-class lab work (see, for example,the first lab). Second, you can take notes by typing significantly faster than by writing. And finally, you can use the net to research questions I may pose. Presents logical database modeling and design, emphasizing the construction and analysis of relational schemas. Covers semantics, integrity constraints, functional dependencies, and table normalization. Practical use of relational algebraic operators, the tuple relational calculus, and their expression in declarative query languages. Introduces basic data mining concepts. May involve student team projects to develop small but representative data collection and analysis applications. demonstrate a good understanding of SQL including subqueries, joins, and transactions. demonstrate the ability to create rudimentary database web applications. demonstrate the ability to use the Apache Web Server/MySQL/PHP stack. During the first day of class, all students will be assigned to permanent teams. Throughout the course, teams will both take team tests and participate in joint activities. Team performance will be one component of your final grade. This consists of units of study roughly corresponding to the chapters of our textbook. The structure of each unit is as follows. First there will be an assigned reading. Following the reading, there may be a short multiple-choice test (the Readiness Assessment Test described below). We will then practice applying the material in class both with individual and group work. If you are at Level Zero when mid-semester reports are due, I will report your work as unsatisfactory. There will be approximately 5 short multiple-choice readiness assessment tests given during the course. Each test will be taken individually, then, immediately after, the same test will be taken as a team. Each individual test is worth on average 60 points; each team quiz is also worth on average 60XP. Makeup tests will not be given. The final will be a comprehensive take home final. Often the fate of what grade you receive for a class, hinges on how well you perform on the final given at the last possible moment of the semester. Our final will work differently. Starting around the midpoint of the semester, I will be posting questions and problems which are part of the final for the course. You can elect to complete the work anytime between the time the problem is posted and our official final exam time. You will gain 10% more XP if you complete the work within a week of the problem being posted. The projects will be team based using Agile Software Development with Scrum. Scrum is a software development process that works on a development cycle called a sprint. In the case of this class, sprints will be two weeks long. At the end of each sprint each team will demo their application. Projects will also require use of the Git versioning system and GitHub. A significant portion of the XP for the projects is given for strictly conforming to the Scrum process and Git. The MySQL Project involves writing a web application using PHP and MySQL about the difficulty level of developing a simple shopping site or simple social networking site. This project will involve installing one of the nonSQL servers mentioned on the homepage (e.g., Apache CouchDB) and writing a simple cloud application such as a very rudimentary GoogleDocs application. A good deal of class time will be directed at doing hands-on work. Sometimes a group will collaborate on one task. At other times, each individual must do something (for example, the first task is to get a web server, and mysql server running), but the idea is that everyone in the team will help make sure each individual will succeed. Each student will rate the helpfulness of all members of their group. Individual group participation scores will be the sum of the points they receive from other members of their team. Each team member distributes 100 points to other members of the team. The average team participation score will be 100 points. The rater must differentiate some of their ratings (they cannot assign the same rating to all members). Collusion is unauthorized collaboration that produces work which is then presented as work completed independently by the student. Collusion includes participating in group discussions that develop solutions which everyone copies. Penalties for plagiarism and collusion include receiving a failing grade for the course. The class schedule is posted on the course website. Here are some other important things you should know. Regarding XP. As in a computer game, there is no negotiation for what XP you need to attain a certain level. 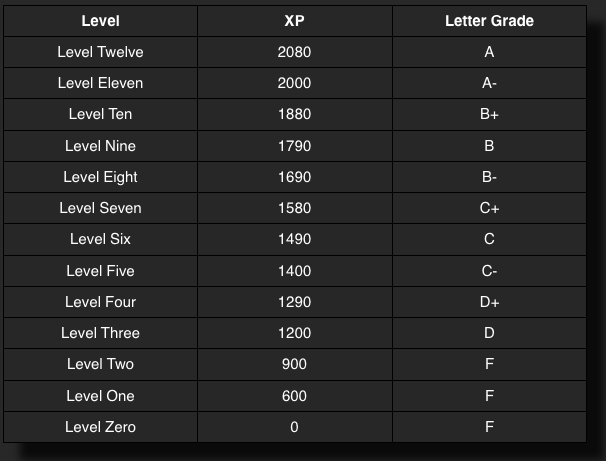 For example, level 11 (the level associated with an A-) requires 2000 XP. Last semester someone sent me email saying they had 1998 XP, they worked really really hard all semester and deserved an A-. I gave him the A- but starting now the boundaries are hard and there is no negotiating. Cheating. Every semester I have multiple cases of people cheating either through plagiarism or collusion (see above definitions). Minimally, I give a person a 0 for that submission. When I taught a New Mexico, I automatically flunked people for an instance of cheating. For example, last semester two people worked together on the final exam. When I sent email telling them they got a zero, one wrote back complaining that this would really affect their final grade. In this class, most of the work will be done in groups, but be very mindful of when you should be doing work on your own. Crowd sourcing and reducing my Cognitive Load. Here’s the deal. When communicating with me please error on the side of giving me too much information. Last semester, I received emails with sentences like “My partner was Austin” (when there were 3 Austins in the class) or “I worked with Matt”. It reduces my cognitive load if you specify what section you are in and give full names.